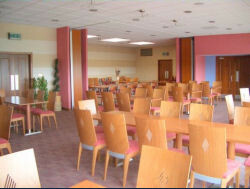 The Ice Rink has a large modern lounge bar where patrons can relax after playing their chosen sport. The bar's viewing area offers a superb panorama over the ice giving members and visitors unparalleled opportunities to watch curling games in progress form extremely comfortable surroundings. Children under the age of 18 are permitted in the bar area, however those aged 14 or under must be accompanied at all times, by a responsible adult. All visitors to the Ice Rink wishing to use the bar facilities must be signed in by a member of Lanarkshire Ice Rink Club. Visitors who curl are granted temporary membership for the day on which they curl and therefore do not have to be signed in. 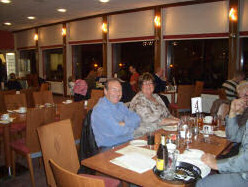 The restaurant has the capability of holding functions for approximately 110 people. Part of the dining area can be partitioned off for smaller private functions and meetings. The catering franchise is operated by Ice Kool Catering, run by Stewart Love. Stewart's email address is icekoolcatering@mail.com and his mobile no. is 07986 321061. The choice of food ranges from simple snacks to full meals. All are competitively priced. Similarly, Lanarkshire Ice Rink Club is happy to invite non-member individuals or commercial businesses to use the facilities provided the rules of the Club are complied with. Ice Kool Catering can provide a wide range of catering to meet everyone's needs. For bookings please contact them on 07986 321061. For anything else, phone the Ice Rink office.